Cryptogram puzzles help to keep you mentally active and fit. 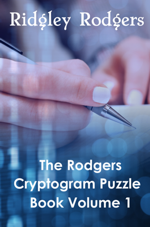 They also provide you with improved word power, vocabulary and spelling, but most of all, solving cryptogram puzzles can also be a great fun activity. If you enjoy solving puzzles, please take a look at Ridgley Rodgers’ other books: The Rodgers Word Search Book For Adults Volume 1, The Rodgers Word Search Book For Adults Volume 2, The Rodgers Rebus Puzzle Book, The Rodgers Bible Word Search Book For Adults Volume 1 and The Rodgers Bible Word Search Book For Adults Volume 2.